Hello everyone! 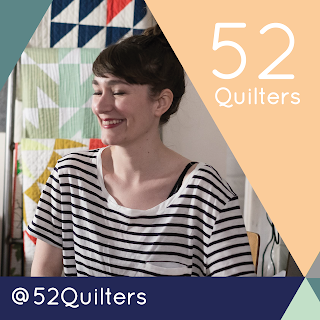 My Name is Yara and I’m the quilt maker behind qvilted. I’m looking forward to sharing some bits of my life with all of you this week! Some facts about myself: I was born in Switzerland and am currently located in crazy Berlin, Germany, where I for a tech start up. But I’m actually a graphic designer by trade. 4 years ago I wanted to sew myself a dress and ended up making a small quilt. I haven’t stopped since and have still not finished that dress. I come from a big family with lots of generations who is very international. My relatives come from Brazil, Italy, Switzerland, France and many have lived abroad for ages. Our homes reflect that by being full of exotic art and furniture. So naturally I've always had a weak spot for all things heirloom and beautiful hand-me-downs (you can spot my favorite object, my great grandfathers Ananaslamp on my IG feed :)) Making quilts combines my love for meaningful and long-lasting everyday objects, my interest in sewing and of course my love for design, pattern and color. I do hope my quilts will stay around for such a long time, too, and tell stories for generations to come! Fabrics used are Botanics by Carolyn Friedlander (one of my biggest quilting heroines) and its quilted all over in baptist fans. Marking it took forever! But finishing this by myself gave me the confidence that I can basically finish all size quilts and all quilting patterns on my home machine. Its tons of work and your whole body aches. But its doable! The swoon lives on our bed all year long. I strongly relate to everybody’s love for pieced backs but for most of my own quilts, I prefer a solid back. The swoon uses Kona Cotton Coral and BAM, its such a great contrast to the front. 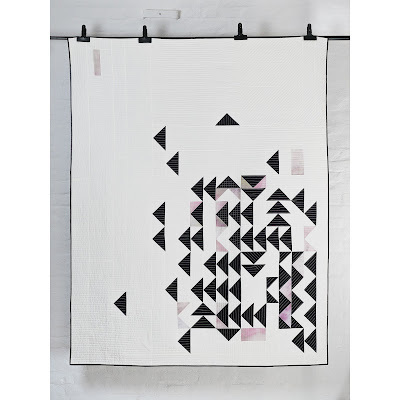 I’ve been drawn to basic quilt blocks lately like half square triangles, flying geese etc. 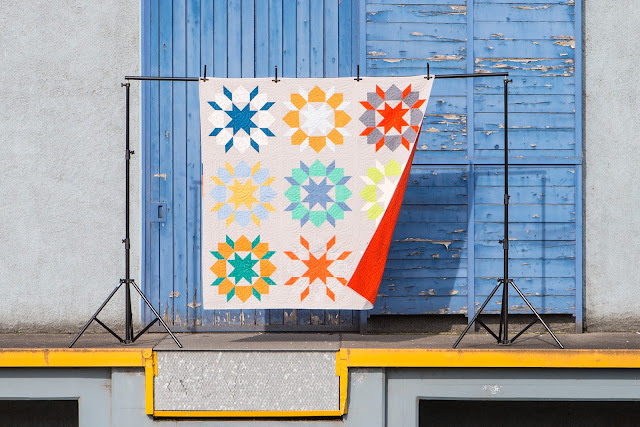 This is the last quilt I finished in 2015 and I’m so proud that it made its way to Pasadena for quiltcon. I love the loose layout and the hand dyed fabrics (bought at a fabric market here in Berlin). To quote my statement from this years quiltcon: When I relocated from my hometown 900 km further up north to Berlin, the buzzing european capital, I did not know where and how I would end up. I had no job and no friends. I started this quilt on my design board and added to it over the course of my first months in an unknown city. As the weeks passed and I began to slowly settle, the arrangement of the blocks started to change, too. Chaotic first weeks transformed into more peaceful, structured composition. I’m not a big blogger, mainly due to time limitations because of realjob. But I like to document my quilts and I share them on my website – my portfolio! I LOVE instagram and have “met” so many inspirering and generous people. Come say hi! I follow your quilting on Instagram. I really enjoy seeing your work pop up in my feed. My daughter lives in Berlin. She is finishing her degree in Urban Design.